Ball gown skirt alice white outside and dusty pink inside 2. 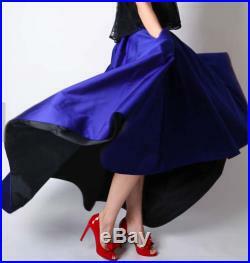 Ball gown skirt alice royal blue outside and black inside the skirt has variations to wear different ways. One side up or both sides up using hidden buttons and hooks under the skirt. Maximum 30back length is 42'' or your choice. Maximum 47'' the waistband is 2'' wide. Waist length is your choice.